The British Racing Drivers’ Club (BRDC) is delighted to announce that Alain Menu and Fabrizio Giovanardi have both been awarded with Honorary membership of the Club. This honour is only awarded to racing drivers from outside of Great Britain and the Commonwealth in the most exceptional of circumstances. 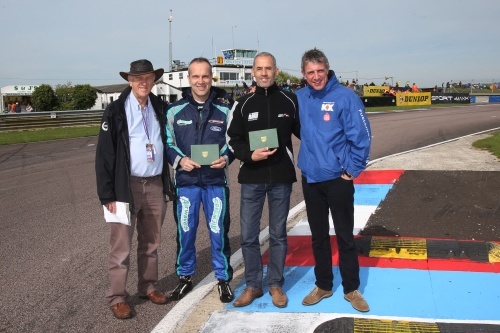 The presentation of their memberships took place at the recent Thruxton round of the Dunlop MSA British Touring Car Championship (BTCC) where BRDC Directors Jason Plato and Ian Titchmarsh welcomed them to the Club. Alain Menu has returned to the BTCC for 2014 with Team BMR looking to add to the success of previous campaigns in the most competitive of national touring car championships. In a career in touring cars that started back in 1992, Alain is widely considered to be the most successful driver of the 1990s and is the only driver during the 1991-2000 Super Touring era to win the Championship twice (1997 and 2000). Special mention should also be given to his BTCC campaigns in 1994, 1995 and 1996 where he finished runner up and also to his FIA World Touring Car Championship campaigns of 2011 and 2012 where he finished third and second respectively. Fabrizio Giovanardi has also returned to the BTCC for 2014 with Airwaves Racing. With eight touring car championship titles to his name, two of which are in the BTCC (2007 and 2008), Fabrizio will certainly be keen to stamp his undeniable class on the championship again this year, as his podium this weekend indicated. His championship victories in the European Touring Car Championship, European Super Touring, Italian Superturismo and Spanish Touring Cars have understandably given Fabrizio iconic status within the world of touring cars and the Board of the BRDC considered both him and Alain to be hugely worth of this rarely bestowed honour. The BRDC would like to extend its best wishes to both drivers for the remainder of the 2014 season and looks forward to welcoming these giants of the sport to the BRDC Clubhouse at Silverstone when the BTCC visits the circuit on 26-28 September 2014.